Blake Anderson wears black high top Converse “Chuck Taylor” All Stars in the series. Blake, Adam and Anders share a tiny cubicle at TelAmeriCorp. 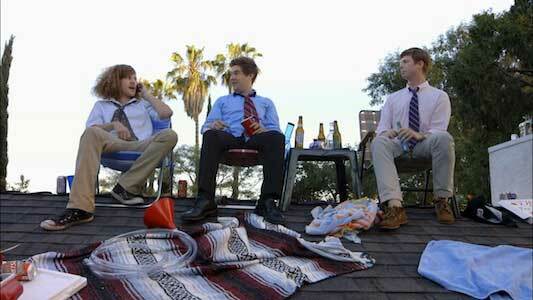 Workaholics is a sitcom that follows three university dropouts as they transition from college to corporate life. 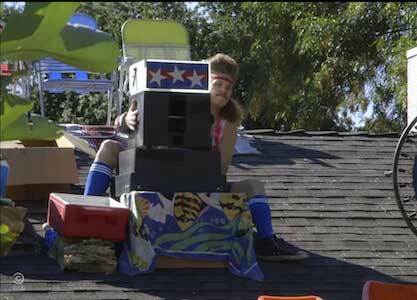 Blake Anderson, Adam Devine and Anders Holm refuse to let immature pranks and rowdy partying be things of the past. Although they have entered the working world, they seem to be allergic to certain grown-up concepts such as dress codes, alarm clocks deadlines and office etiquette. Each of them brings something different to the table, fueling the fire of their somewhat offensive, typically destructive and altogether unpredictable antics. To make matters worse, the trio shares a cubicle at work. Despite their obligatory efforts to act like young professionals, they always manage to behave like college students. Blake, Adam and Anders watch their fellow neighbors as they chat and enjoy some beers, college rooftop style. Adam Dwayne DeMamp (Adam Devine)—the obnoxious, childish and vain member of the trinity—is known for being rather rash and destructive. He prides himself on being everyone’s friend and is extremely confident, which is why he is a great candidate for telemarketing. Despite his self-proclaimed “animal magnetism,” he has little regard for other people’s feelings. He and Blake were roommates in college, which contributes to their inability to abandon the college lifestyle. Anders "Ders" Torfinn Holmvik (Anders Holm) is the most professional and responsible of the three. He was Adam and Blake’s residential advisor in college, which is how the three of them got acquainted. Being the quintessential pushover amongst trouble-hungry hooligans, Anders’ passive disposition and naivety inadvertently strengthens the pranksters’ ability to get away with just about anything. Blake Anderson wears black chucks as he prepares to launch tennis balls at Adam during a friendly game of American Gladiator. Blake Chesterfield Henderson (Blake Anderson) is the most peculiar of the young men and he is almost always wearing black high top chucks. He has an odd personality but is very likeable, down to earth and easy going. His keen sense of humor and self-confidence make him well suited for telemarketing. Much more apathetic than Adam and more strong-willed than Anders, Blake has a relatively deep understanding of the human condition, which why he tends to be the voice of reason. Blake wears his chucks everywhere: to work, to parties, to the marijuana dispensary—you name it! With long curly hair, a mustache, and a religiously un-tucked-in shirt, Blake appears to be sloppier and more disheveled than his clean-cut counterparts. He is the “stoner” of the group and his appearance makes that clear. As the series progresses, he proves to be more put together than one would assume. Wearing his kneepads and chucks, Blake smashes at rats after the food fight. The episode “Friendship Anniversary,” begins with Blake, Adam and Anders playing “American Gladiators” in their front yard. According to Anders (the referee), the contestant (Adam) will have two minutes to complete the obstacle course without getting shot down by tennis balls, which Blake is launching from the roof. The trio receives their lease in the mail, which marks their seven years anniversary of being roommates. While celebrating their “Friendship Anniversary,” the boys get into a food fight. Once a truce is enacted, each of them denies starting the fight because nobody wants to be responsible for cleaning up. They end up abandoning the messy house and going their separate ways for the night. When they return to the house the following day, there are rats everywhere eating the food fight scraps. The boys decide to obliterate the rats with their bare hands and feet—they smash them with baseball bats, stomp on them, chuck them at walls, and slap-shoot them with hockey sticks. When they finally kill all the rats in the house, they discover a rat nest in their basement. As usual, they devise a poorly thought out plan to get rid of the rat nest, which literally ends up backfiring. After a failed attempt to get rid of the rat nest, Blake falls over and flashes his go-to pair of black chucks. In the episode “Gayborhood,” Blake, Adam and Anders have to compete with their neighbors and friends in various lighthearted relay games. They are not amused when they find out that their gay neighbor is convinced that the three of them are gay. The neighbor makes his conspiracy about them very clear when he reveals that their team shirts are rainbow. Blake wears chucks as the trio chats about sportsmanship with a neighbor. Each of the main characters plays a specific role, which makes their adventures incredibly unpredictable. Adam is the self-absorbed narcissist, Anders is the “goody two shoes,” and Blake is the sensitive one. They are all neurotic in their own ways but the most practical of the three (Blake) wears chucks all the time, which goes to show that chucks can are the practical choice because they can survive even the most relentless of exertions!